Rajan is the Vice President & Managing Director of Google, South East Asia & India'. As an angle investor Rajan has backed many a successful startup and focusses on investing in internet, mobile and SaaS companies.Prior to his role at Google, Rajan was part of the leadership team at Microsoft and Dell. 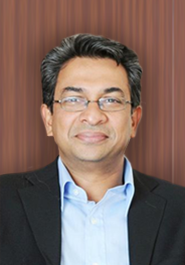 Rajan has a Master's degree in Manufacturing Systems Engineering from Stanford University and a B.Sc. in Mechanical Engineering from the Massachusetts Institute of Technology.